Daelia’s Food Company caught our eye a few years ago with its line of artisan biscuits for cheese. They’re based on an old Mediterranean recipe, twice baked in small batches to create very crisp, three-inch-long flats. The sweet and toasty nut flavors—including Almond with Raisins, Hazelnut with Fig and Pumpkin Seed—go with all types of cheese. The company has recently released a new cracker creation, whole grain Beer Flats. They’re a thick, strong, macho cracker with great flavor. We enjoy them so much, we don’t need any cheese. We devour them from the box as a crisp snack, and serve them with soups and salads. 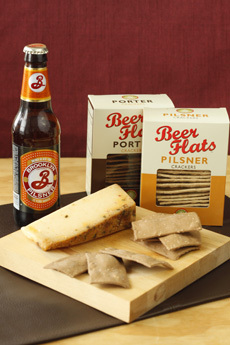 The lighter-colored Pilsner Cracker is made with light rye flour and pilsner beer. The flavor is reminiscent of a buttery biscuit—only crunchy! The darker Porter Cracker is made with dark rye flour, caraway seeds and porter, with inspired touches of cocoa and molasses. It has the delicious flavor of pumpernickel. We enjoyed it equally with mild, fresh goat cheese, and pungent Epoisses. With or without a bottle of beer, Beer Flats rock as crackers and snacks. Photo by Elvira Kalviste | THE NIBBLE. Both crackers deliver a seductive creaminess from the butter in the recipe; the creamy quality pairs perfectly with the creaminess of cheese. The beer adds an exciting malty nuance, and along with the butter, makes these distinctive crackers well worth the price. The sturdy texture and thickness of the crackers provide maximum crunch. A story on the package tells that around 4000 B.C.E., an innovative Mesopotamian used beer instead of water in a recipe for grain cakes, the precursor to modern bread. Cheers to that baker! A 5.5-ounce box of Beer Flats is $7.99 at specialty food stores and on Amazon.com. Pick up a few boxes for your own enjoyment, as a gift for beer and cheese lovers or anyone who appreciates fine food. The crackers can be served with charcuterie, dips and spreads, hummus, pâté, prosciutto, smoked salmon or as a base for crunchy canapés.